Product prices and availability are accurate as of 2019-04-14 19:30:51 EDT and are subject to change. Any price and availability information displayed on http://www.amazon.com/ at the time of purchase will apply to the purchase of this product. Germination rate is 79% for these seeds. Each packet includes 105+ organic tomato seeds. Each packet has 1 plant marker included and has instructions for easy planting. Most heirloom varieties are quite productive and will greatly benefit from sturdy supports. 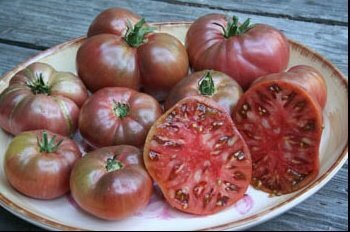 It may also be advisable to add blood and bone to the worked soil to help ensure healthy productive heirloom tomatoes. Huge 1-2 pound beefsteaks that are lightly ribbed and full of that old time tomato flavor now gone in store bought types.